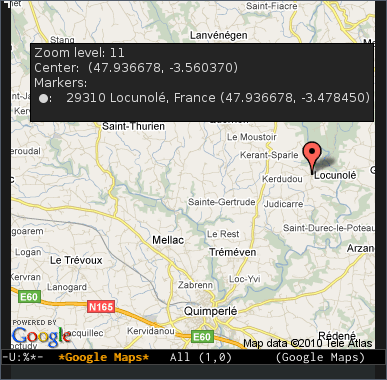 Last week, I worked on my Google Maps for Emacs extension. I've introduced a new format handling for locations which include the longitude and latitude. The initial format was just a string describing the location, which was obviously too limited. It now prints coordinates of the different elements when the mouse is over the map, with other information. It also center the map on M-x google-maps and set a default zoom level. This is something which was not set because it's not a good idea to set center coordinates in order to see all points on the map automatically. But you can still remove the centering by pressing "C". On the other hand, setting it automatically allows to move the map easily, and I think that what most users want to do. I've also added a "place my home on the map" feature, accessible by pressing h on any map. That adds a marker according to the location set in Emacs using the calendar- variables. This feature is also available under Org by pressing C-u C-c M-l, which shows the location of your appointment with your home on the map too. Finally, you also get caching so it does not request images you already seen, which makes the moving nicer and faster to use, and prompt history.